Caffari's campaign, already backed by the Mirpuri Foundation and Ocean Family Foundation, is dedicated to the issue of ocean health. 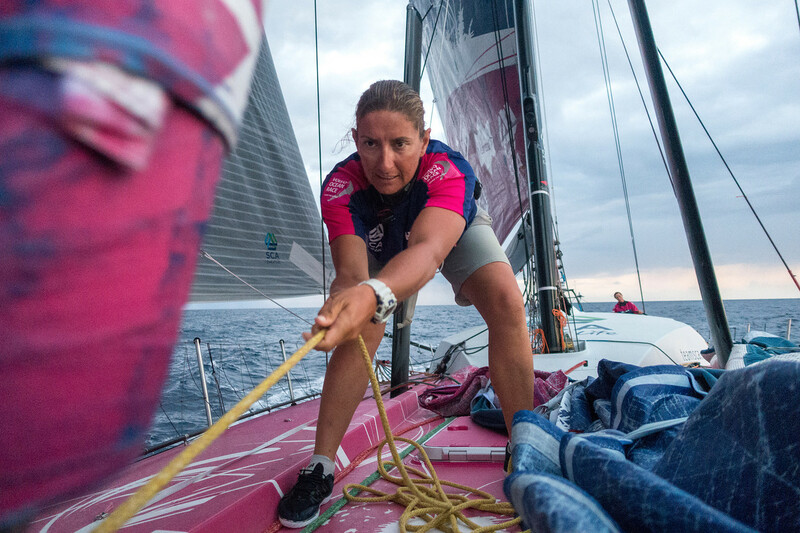 Britain's Dee Caffari will lead 'Turn the Tide on Plastic' – a mixed, youth focused team with a strong sustainability message in the Volvo Ocean Race 2017-18. Her campaign, already backed by the Mirpuri Foundation and Ocean Family Foundation, is dedicated to the issue of ocean health. The sixth confirmed team out of a possible eight for the upcoming edition will amplify United Nations Environment's 'Clean Seas: Turn the Tide on Plastic' campaign throughout the eight months of the race, which covers 45,000 nautical miles of racing around the world, taking in 12 Host Cities on six continents. Caffari's ambition is to build a multi-national, 50-50 male/female squad, with the majority under 30 years of age. As part of the sustainability focus, the messages around diversity in age and gender will be strong themes of a campaign that in sporting terms may not start as a favourite, but could easily surprise on the water. "I'm absolutely delighted to get the opportunity to sail for a cause I am so passionate about," said Caffari, whose UK-based company will also run the project. "The Volvo Ocean Race is the ultimate test of a team in sport, and with the ambition to race with a youth-orientated international mixed crew, we are looking to make an impact on and off the water." Caffari's team is already part-funded by the Mirpuri Foundation and Ocean Family Foundation (OFF), who join an increasing number of partners backing Volvo Ocean Race's campaign on ocean health and sustainability. In addition to raising awareness around the growing issue of ocean pollution, the partnership is part of the Mirpuri Foundation's long-term ambition to build a new chapter in Portugal's rich maritime history by creating a strong offshore legacy for future generations of Portuguese sailors. Caffari will include two Portuguese sailors in the team with a view to building a full Portuguese team in future editions of the iconic race. "We feel immense pride to be backing this incredible ocean health campaign which we are sure will provide a great contribution to the health of our wonderful blue planet," said Mirpuri. "We must act immediately if the next generation is to inherit seas and oceans which resemble those that we knew as children." He continued: "In Portugal, we have long held a rich maritime heritage, and this youth-orientated campaign is a major step towards shaping the world-class future of Portuguese offshore racing. The Mirpuri Foundation looks forward to working closely with the Volvo Ocean Race to achieve that objective over the coming years." Alongside the Mirpuri Foundation, the aim of the Ocean Family Foundation is to promote awareness of the effects of pollution, the importance of bio diversity and the necessity for conservation of the world's oceans. "The Ocean Family Foundation is delighted to be supporting this exceptional campaign to support ocean conservation and clean-up," said Peter Dubens, on behalf of the Ocean Family Foundation. "Plastic pollution has emerged as one of the greatest challenges facing our globe, with plastic debris forecast to double over this decade, causing huge damage to our oceans as well as to humans. "With her public profile as a British world record-holding athlete, Dee Caffari is the perfect leader to raise awareness of the need for urgent action." Caffari is an experienced round-the-world sailor who will return for a second consecutive edition, having competed on Team SCA in 2014-15. She is also notable for setting a landmark record in 2006, becoming the first woman to sail single-handed and non-stop the 'wrong way' around the world. "It's an honour to represent this landmark campaign, and to lead the team on such a prestigious platform is exciting," said Caffari. "Seeing the amount of plastic in the ocean is heartbreaking. We're abusing our planet – and this campaign is about pushing people to proactively do something about it. "We will be sailing with a youth-orientated team because the reality is, it's going to be the next generations who inherit the mess that we're making now. This is a major issue and we need to encourage this generation, and future generations, to step up." The Turn the Tide on Plastic boat will amplify the Volvo Ocean Race's larger sustainability focus for 2017-18, and joins team AkzoNobel (Simeon Tienpont, Netherlands), Dongfeng Race Team (Charles Caudrelier, France), MAPFRE (Xabi Fernández, Spain), Vestas 11th Hour Racing (Charlie Enright, USA) and Team Sun Hung Kai/Scallywag (David Witt, Australia) in the fleet for the 2017-18 edition. Mirpuri himself is no stranger to life offshore, or the Volvo Ocean Race. To raise awareness of the Foundation's 'Save The Ocean' marine conservation campaign, he recently skippered the former Green Dragon Volvo Open 70 yacht – renamed Mirpuri Foundation – on a 2,300-mile passage from Cape Verde to Bermuda.